The Savage Life of Herman Lehmann. Maurice and Augusta Johanna Lehmann were German immigrants who met and married in Texas in 1849; settling near what would later become Loyal Valley in Gillespie County. In the Spring of 1859 they gave birth to their first son and named him Herman. As they gazed down upon their cooing offspring they must've wondered at his future. Doctor? Lawyer? Indian chief? Imagine his mother's surprise when (eight years later) she found out it was Indian chief. German immigrants in mid 19th Century Texas didn't have it easy. Although John Musebach had had success with treaties between the settlers and the semi-nomadic Comanches, still there were people who "didn't get the memo." There were Comanche renegades, parties that didn't read the fine print, parties that didn't bother to read the large print and then there were the Apaches. The Lehmanns had three other children, two girls and a boy named Willie. Mr. Lehmann died in 1864 and Augusta soon found another husband / father in Philipp Buchmeyer. I'd say that the children were playing one spring day in 1870, but knowing they were German, they were probably building rock walls, digging wells, milking deer or doing something constructive. Suddenly, without warning, a group of Apaches (not Comanches) swooped down on the defenseless group, capturing Herman and Willie, and leaving the girls to explain to Mama why Willie and Herman weren't at the dinner table. Willie managed to escape after a week or so and find his way home; but Herman's odyssey was just beginning. Before he had had a chance to attend even a single day of German school, Herman found himself suddenly enrolled in the Apache school of hard knocks. He survived "Initiations for German Settlers' Children," and managed to pass basic ASL (Apache as a second language). Herman's Indian mentor was a notorious Apache warrior known as Carnoviste, and when Carnoviste wasn't busy killing settlers or rival Indians, he instructed young Herman in all the lore that Apache boys needed to become Apache men - which was mainly killing Comanches, Rangers, Mexicans, and white settlers - in no particular order of preference. On his travels, Herman crossed trails with some Comanches. Although they first recognized his Apache fashions and almost killed him, they also noticied his third-degree sunburn. He joined up with them and his new companions called him Montechena (which is Comanche or Spanish for something). Among Spanish-speaking Indians he was known as Alem�n - or "German." With his new companions, Herman fought the United States Cavalry and their allies, the Tonkawa. He was captured and interred with Comanches at Fort Sill and is said to have been adopted by none other than the famous Chief Quanah Parker. His European features and fair skin gave him away and he was sent back to Texas to be reunited with his original family. He arrived in Gillespie County in May of 1878 - almost exactly eight years to the day that he was captured. Herman's reentry into "polite" society had its rough spots. Eating family pets, refusing sauerkraut, and chanting when everybody else was trying to get some sleep tried everyone's patience. Little brother Willie, who must've been thinking "Aber f�r die Anmut des Gottes, gehen Ich," tried his best to explain to Herman that killing the neighbors' livestock was frowned upon. Willie also coached Herman in German and generally kept a protective eye on his older brother. Since there were no state-run halfway houses for former captives, Herman lived with his family at his mother's boarding house. He prefered wearing his Indian regalia and frequently appeared at meals wearing little else but paint and feathers. Guests either found Herman's habits amusing or found other lodging. Herman finally got around to enrolling in school. As soon as he realized his credits for life-experience didn't transfer, he immediately left. He longed to do what he was good at, but with killing now out of the question, he tried his hand at odd jobs - including signing on as a cowboy on a trail drive to Kansas. 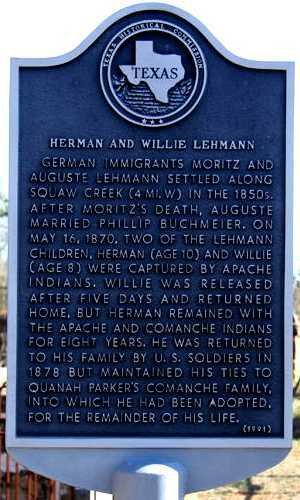 Herman and Willie Lehmann historical marker in Loyal Valley Cemetery. Herman finally settled down for good at Loyal Valley. He was said to have had a sense of humor and he certainly enjoyed his celebrity status. - which was [probably] curtailed when he married Miss Fannie Light in 1890. Since his last employment as an Indian was as a Comanche; he became eligible for an Oklahoma land grant. He and Fannie had five children and spent their lives between their home in Oklahoma with frequent visits to Texas. Hermann posed for the portrait (above) during a 1928 Trail-Rider's Convention in San Antonio. He died in 1932 and is buried in the Loyal Valley cemetery.